MP3 Cutter Joiner Free is an aspirational program for music lovers especially one who likes to create his own music and need some cutting, enhancing, joining, etc. With this free MP3 cutter + joiner one-stop solution software, it is convenient to join together multiple audio files into one single file and cut large audio files into smaller pieces. This tool enables you to accurately extract your selected segments of an audio file to a new one. So you can use this easy-to-use audio trimmer to trim audio files to the exact length you want, keeping the part needed and remove the rest. The inbuilt free MP3 joiner tool enables you to create your own mash-ups by joining audio files and recordings to a single musical file (audio concatenation). For example, you can join your separate audiobook chapters into one big audiobook to organize your audio books; combine multiple music tracks into one non-stop audio CD; prepare jokes by joining completely different sayings of your friends and so on. It's up to you. MP3 Cutter Joiner Free also provides an audio converter mode which can be activated in the MP3 joiner. It enables you to convert any formats of audio files to key audio formats. You are allowed to import as many audio files as you want to convert. 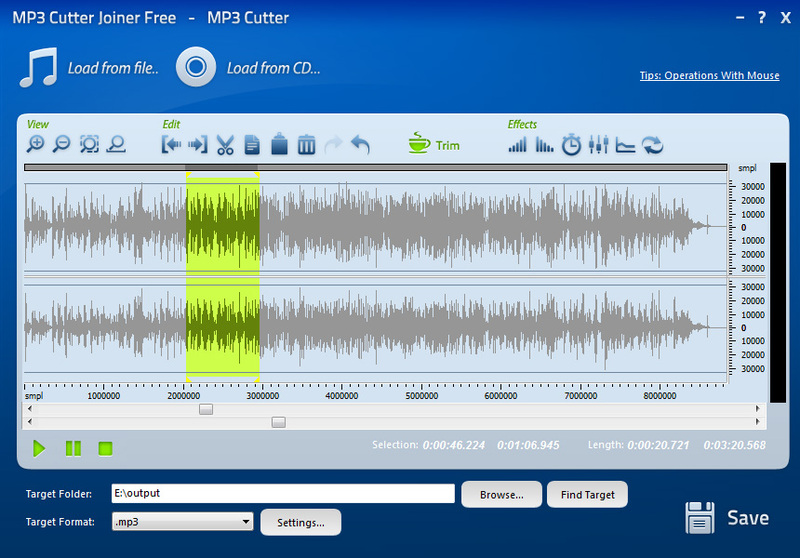 MP3 Cutter Joiner Free, is the ideal music service for audio cutting. You can cut a small piece of your favorite song to use as the background music for your presentations, exhibitions & movies or welcome theme for websites. Of course, they are also suitable for environments such as hotels, casinos, shopping malls and other retail situations. Want to create great quality professional-style tailor-made ringtones and tunes? MP3 Cutter Joiner Free is the perfect tool to create unlimited ringtones from any music CD or MP3 files easily. Then, you can upload them to mobile phones to show your own-style personality; post on your website or on YouTube for distribution and more.